A recent article from Ana Ferraria et al. at the Technical University of Lisbon presents some excellent results and analysis of a variety of silver species. 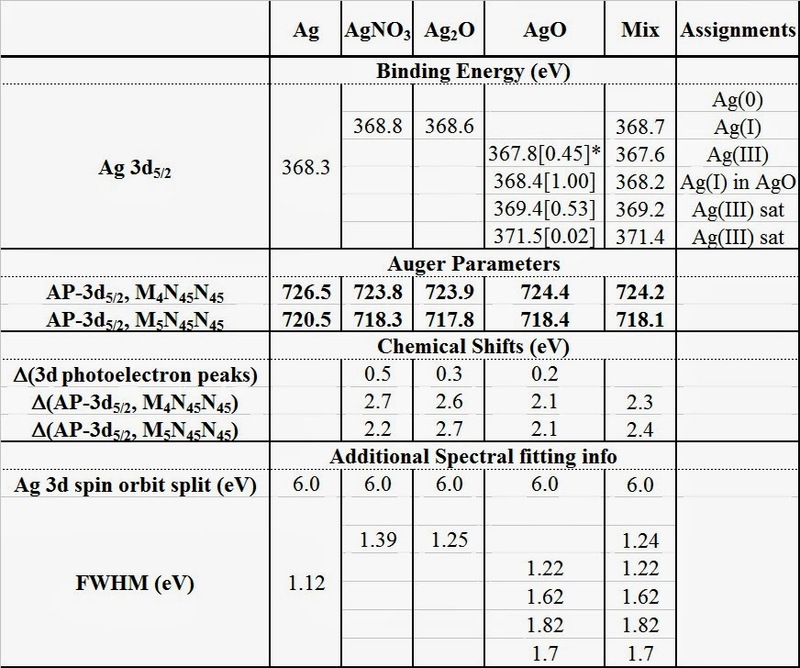 Ag 3d5/2 binding energies and Ag Auger parameters using both the M5N45N45 and M4N45N45 peak maxima are included (see Table 1). Curve-fitting of the Ag 3d5/2 line has also been carried out (Figure 1 and Table 1). Of particular note is the presentation of high quality Ag MNN spectra which show distinct peak-shapes for metallic silver, AgNO3, Ag2O and AgO (Figure 2). Table 1. 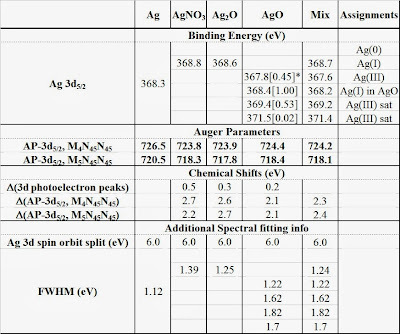 XPS Ag 3d fitting parameters, Auger parameters and atomic ratios for Ag, AgNO3, Ag2O, AgO and a mechanically mixture of oxides (AgO + Ag2O). Figure 1. 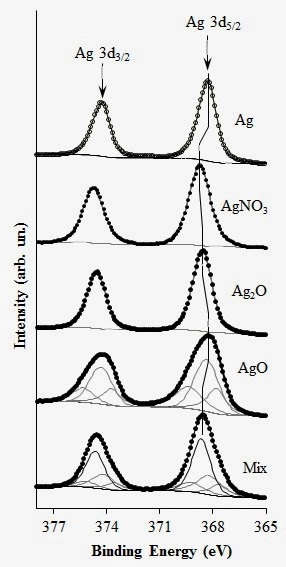 XPS detailed regions of Ag 3d for (top to bottom) Ag foil, AgNO3, Ag2O, AgO and a mechanical mixture of Ag2O and AgO . Figure 2. 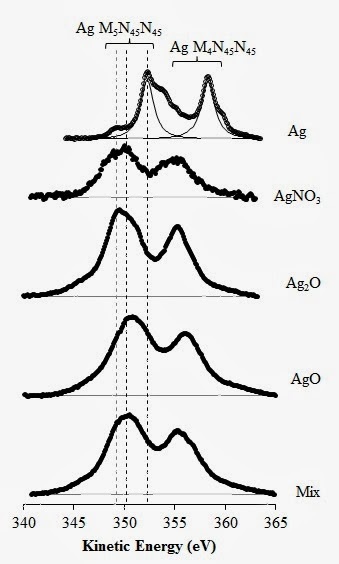 XPS detailed regions of Ag MNN for (top to bottom) Ag foil, AgNO3, Ag2O, AgO and a mechanical mixture of Ag2O and AgO . A.M. Ferraria, A.P. Carapeto, A.M. Botelho do Rego, Vacuum, 86 (2012) 1988-1991.